Find the Right Major for You with These Resources! The last day to declare a major before Fall 2019 course registration is Friday, February 15th! There are events and resources available on campus to help you make this major decision! Whether you’re undeclared or considering changing your major, these resources will be a great help. 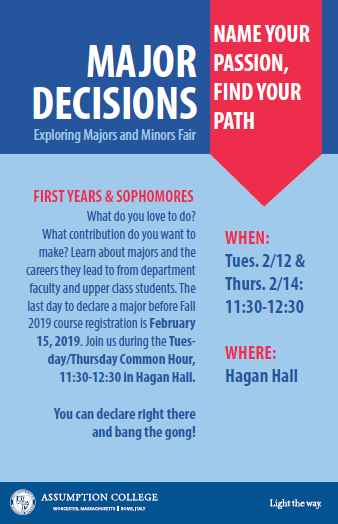 Freshmen and Sophomore students will have the opportunity to explore their options for majors and minors at two fairs next week during the common hour. The event allows students learn from faculty and upperclassman students on Tuesday, February 12th and Thursday, February 14th from 11:30 am to 12:30 pm in Hagan. Students will have the opportunity to ask questions about majors, minors and about opportunities related different disciplines. If you have already registered, use your Houndmail username and password to continue exploring your options! Be sure to save occupations and areas of study (majors) that you’re interested in so you can access them again later in your portfolio! Explore majors that have common threads, as well as exciting classes offered within those disciplines. From the CDIC Edge homepage, you can select any Career Community and see what featured classes are being offered, as well as what career fields students might pursue. As always, the Assumption College faculty and staff are here to help you through your decision-making. Be sure to meet with your academic adviser to discuss what classes you’ve enjoyed so far and what majors might be a fit for you based on your interests and strengths. You can also book an appointment with the CDIC to explore how your past work experiences, general areas of interest, previous coursework, and potential career goals translate into a major at Assumption College. By using the resources available to you, you’ll be sure to select a major that’s a fit for you.